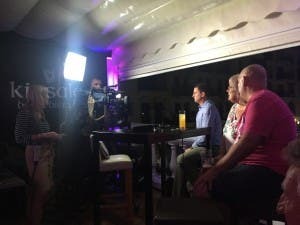 EXPATS in Duquesa port experienced an emotional roller coaster as they gathered to watch the live EU referendum results last night. With ITV on hand to film their reactions at Irish bar Kinsale, the mood was optimistic as they pulled up chairs to get a good spot of the live results broadcast. Hopes were high given that the bookies had been predicting a Remain victory since campaigning began, even increasing the odds as the first few results came in. ‘The bookies are never wrong’ was the phrase being thrown around, and when Nigel Farage admitted defeat, claiming the Remain side had probably ‘edged it’, there were cheers all around. The moment was short lived, however, as the Brexiters produced a remarkable turn around, making unexpected gains in Wales and bigger than expected margins in Northern England. “I am absolutely devastated and wish I could wake up from what feels like a very, very bad nightmare,” said Brit Tamara Essex, 57, originally from Dorset. Expats shed tears and exchanged hugs as ITV announced a 75% probability of a Leave victory. As the final votes were clocking in around 4am and hopes of a comeback faded, a shocked and sombre tone filtered through the bar. Emotions were still running high the following morning, with the sense of shock still very much present. 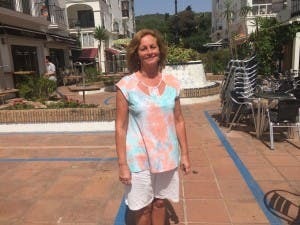 The sense of disappointment was shared across Duquesa’s expat community. 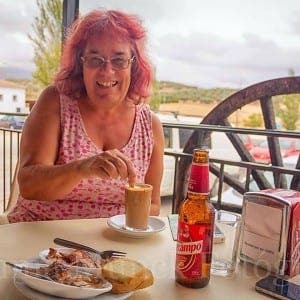 “I cannot believe we have left, I have a life here, I love Spain, but now we are going to need a visa to potentially work here or could even be sent home,” said barmaid Jayne O’Regan, 47, from West Yorkshire. 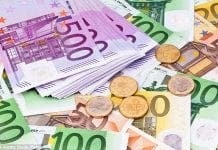 Expats will now face an uncertain future after the life they have become accustomed has been launched into uncertainty. 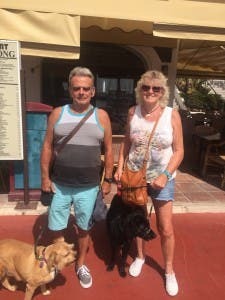 “We wanted to stay because we rely on the healthcare out here, and now we don’t know if that is going to remain in place or whether or not the terms are going to change,” said Fiona and Bill Reade, from Liverpool. “We are very concerned about our future here because it’s just such an unknown. Congratulations England (I guess that “United Kingdom” isn’t applicable any more), you have truly earned the title “The Donald Trump of Nations”. Yes, yesterday was a huge result for Freedom and Independence, in the true sense and not in the delusional sense of the SNP, who are showing their true colours by screaming for another referendum. What really annoys me about Sturgeon is the misguided rhetoric that Scotland has been dragged out of the EU undemocratically. Did she forget that we had a referendum and we voted to remain in the UK. Also, we had another referendum yesterday on the EU, and should accept the democratic result of the entire UK. Going by Nicola’s logic, London could have a referendum to leave the UK, and join the EU again. She is a contemptible bigot, who’s agenda is to leave the English at any cost, at any excuse. The multi-nationals, banks and vatican who are behind and created the EU, after their fast track approach failed with Hitler, Mussolini, and Franco, have gambled with Cameron on giving this referendum in the confidence that their misguided and biased coverage would scare the people of the UK into voting remain. Then they would have a clear path to really shaft us all over the next years, as their European branch of the New World Order finally takes shape, (why do you think Obama was so anxious for us to remain in the EU). Plan B might be the SNP and Republicans to divide the UK within. However, as I understand, Westminster could rule out another Scottish referendum, and maybe with a bit of luck and inspiration, over the next two years, the rest of Europe might weaken with other countries like France having a referendum. This vote is huge, and I hope is the springboard to a better Britain and future for our children and grandchildren. I hoped for this but did not expect it. It is up there with defeating the Armada against all the odds, and defeating Fascism after the World Wars. It is the true path to freedom, and they have underestimated the British people. The people of Britain have seen through the lies, deceit, and blatant bias, and with a very high turnout have voted to stop the rot. Cameron made it clear a million times that this vote was final and there would be no going back. Let’s hope this is the case and the EU don’t try more dirty tricks to have another referendum. Finally, the brave men that fought in those two wars would be proud of this vote today. Armada? New World Order? Vatican? Them eyes sure do swivel. Typical of the poor deluded fools who fell for the Farage/Johnson/Gove schtick. this was not a war but a plebiscite which leaves behind a deeply split British society. You still have the choice between being Little England or being a member of the European civilization, as this plebiscite is not binding the British parliament in a legal way, but of course in a political sense. As the majority of the members of the British parliament still support the EU, the best way to keep peace in the UK would be if the entire British parliament resigns immediatelly and the Queen orders a new election of the parliament. Obviously this will destroy the existing political party system, as the new election will be held between supporters and opponents of a Brexit and not between Labour and Conservatives. But isn’t that worth to avoid the disintegration of Great Britain? And to avoid the dominance of Germany inside the “remaining” EU? (We Germans more likely fear to be now dominated by the South members of the EU). What, if the result of the Spanish election tomorrow will be the same as of December 2015? 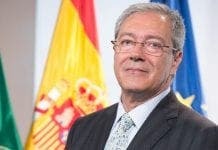 Will then a “managing” British prime minister negotiate with a managing Spanish prime minister the future of Gibraltar? Obviously the reintegration of Gibraltar into Spain will be the only topic on the Spanish political agenda where all Spanish parties will support managing prime minister Rajoy. May I recommend a walk into the hills behind La Linea, where you will detect, that most of the Spanish artillery positions are headed towards the port of Gibraltar? “Enjoy” your war! The only fools that are deluded are the fools that voted to remain in the EU. Regarding the Vatican. It was devout Roman Catholics Konrad Adenauer, Robert Shuman, and Alicide de Gasperi who are the founding fathers of the EU, forming the Steel and coal coalition or Treaty of Paris. The Vatican has beatified them on the way to Sainthood. The EU was to be the new Holy Roman Empire with the Pope as the head. The Vatican has invested heavily in the multi-nationals who are the policy makers in this undemocratic fascist gravy train. Your eyes can swivel all they want Sefano, but that’s the truth. You wouldn’t know the truth if it bit you on the bum my strange friend. The swivel-eyed ones I refer to, are yours and your odd mates, by the way. Robert, so what comes next? : HMS Ambush fireing a tomahawk cruise missile onto ‘catholic’ Spanish town of Manilva, in order to defend Britains sovereignty on Gibraltar? Military invasion into ‘catholic’ Scotland? And how will Great Britain manage the fragile situation in Northern Ireland without the moderating influence of the EU? Are you looking forward to renewed bomb attacks by the ‘catholic’ IRA in London? You wouldn’t know democracy if it bit you on the bum Stefanjo, and that’s why you are in the remain camp. Stefanjo wants to be ruled by a fascist dictatorship, that my friend is the truth, regarding the EU. Wolfgang, you have lost the plot, talking complete nonsense, but then again you are pro EU too, says it all.